Chaaaaarrrge into a new year! That’s the rallying cry of Pirate decks everywhere. Initially pirate decks were viewed with some degree of novelty. Early Pirate decks had access to cards like Ship’s Cannon. Heck, even cards like Captain Greenskin and Southsea Captain were not only considered, but included. Unfortunately we’re playing Standard right now, so that Ship’s Cannon is no longer a thing. You could bring it out in Wild though. The overall game plan of playing Pirate Warrior is to try to swarm and overwhelm your opponent fast. You have many early drops available to bust a hole right through your opponent. Your first priority is to keep Patches out of your hand. After that, look for N’Zoth’s First Mate, Small-Time Buccaneer, or Southsea Deckhand. Can’t really go wrong with Fiery War Axe if you don’t happen to have a First Mate. Having a weapon early helps you control the board depending on your opponent. If your hand is full of trash though, you may as well throw out the entire hand and bank on hitting a nice curve to start the game. Ideally, you want to be on the initiative and play minions in the opening rounds. Sadly, with my luck, I end up ditching Patches and then I end up drawing him anyway. Play a Pirate to fetch Patches and attack your opponent directly. Seriously. Just play your Pirates. You might even consider coining out a second 1 mana drop minion on the first turn based on your matchup. The Faerie Dragon is optional (and I’ve included other replacement cards further below). The Dragon offers a nice early game threat that can’t be dealt with easily with spells or hero power abilities. If you play Finley early on, look for Life Tap or Steady Shot to help you draw cards . 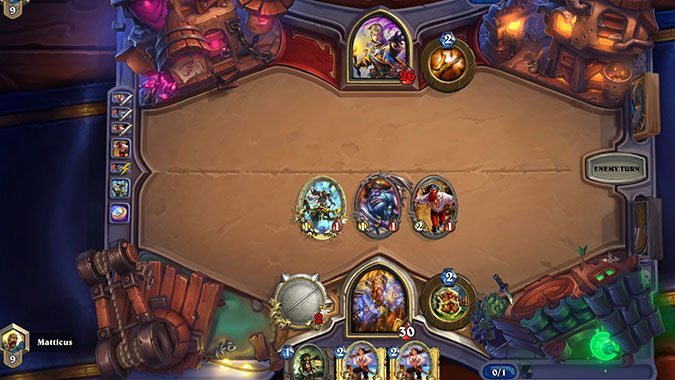 Tip: In 75% of games, Matticus ends turn 1 immediately after playing a 1-mana Pirate and completely forgetting to attack with the summoned Patches. Do not be Matticus. Always attack with Patches. Think about your opening sequence. In this case, it was N’Zoth’s First Mate which procs Patches, then Coin out the Southsea Deckhand. Playing the Deckhand first instead of the First Mate would not have given it Charge. As you transition to the midgame, start targeting your opponent directly. However, hold off on using up all of your weapon durability — you might want to draw into an Upgrade or a Bloodsail Cultist that can help strengthen your weapon. Your Berserkers should be hitting the field, and you want to try to protect them as much as you can because they’re a legitimate threat. Your weapons, Heroic Strike, and Dread Corsairs should be able to help with that. Start directing your attacks at your opponent around this stage. You want to get them low. In theory, there really is no actual late game for the deck. The longer game drags on past turn 7, the lower the chance of victory. Don’t be afraid to use your health as a resource by using your weapons to attack into enemies. Mortal Strike hits harder if your health is at 12 or lower. You can burst your opponent down quicker, or rely on it to clear out a taunt minion that’s in your way. By now, you should be closing out your game with some combinations of Arcanite Reaper, Leeroy Jenkins, Kor’kron Elites, and Mortal Strikes. Technically considered late game. As you can guess, I’ll have already lost here. With some minor modifications, you can actually slot in some dragons and turn it into a Dragon Pirate Warrior instead. You get the same potential early game aggression with Pirates and the controlling late game dominance of Dragon utility. Acidic Swamp Ooze is your tech option against mirror matches. It can also be used with powerful effect against Jade Shaman and Rogue players. If you don’t like the Faerie Dragon, you can swap it for a Southsea Captain instead. Hobart is another tech option that provides your weapons with more power (like swapping the lone Faerie Dragon in the list for Hobart). Your Fiery War Axe and Arcanite Reaper get much stronger. Now all of the swapping in the dragon package means cutting down on your early game potency. But it provides you with added utility for games that do stretch out in the long run. In this case, you can look for a pirate to help activate Patches, or look for any dragon to help activate Alexstrasza’s Champion. Corruptors provide you with added board control. Crushers are your late game bombs to help finish off your opponent. Don’t stress about playing them with their battlecry active or not, just play them because they provide you with big board presence. Druid: Jade Druid decks are competitive now even though they might take a bit of time to get going. You can tell who the better Jade Druid players based on which selection they make regarding Jade Idol. (Hint: You should not shuffle 3 copies of Jade Idol into your deck right away.) Knock out any early, weak Jade Golems you see. They can cause trouble for you later on. Hunter: This class shouldn’t be a major problem. Unfortunately, I haven’t seen many Hunter decks during my climb up the ladder so far. 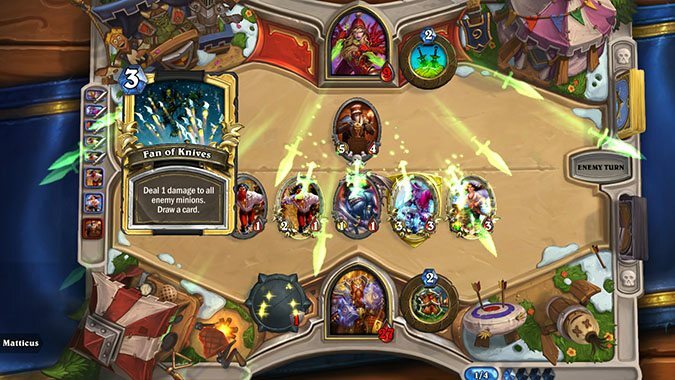 The nerf to Call of the Wild might’ve been almost too much. Race and burst them down hard. If you see Savannah Highmanes or if Call of the Wild goes off, it just might be too late. Mage: Dropping a Faerie Dragon is amazing here, as they can’t blast it with a Frostbolt or use their hero power against it. Tempo Mage and Reno Mage are the variants you’ll most likely run into. If you see a turn 1 Mirror Images, it’s almost worth a concession because you might not be able to come back from that. It’ll slow you down too much. Your priority is to kill the Flamewaker when it hits play, or else it’ll wreck your board. Paladin: You know, I’m not actually sure what Paladins are running these days. I haven’t seen many of them at the higher ranks. 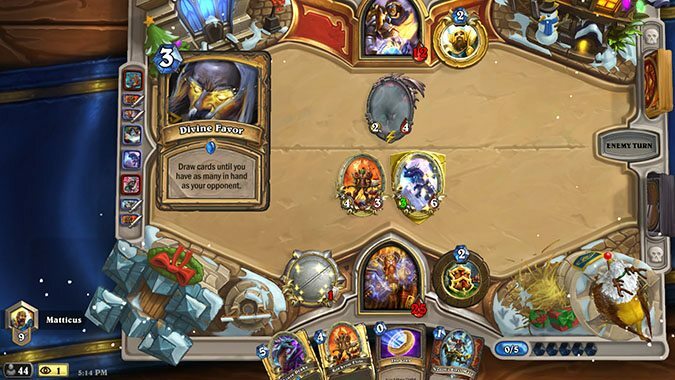 There’s been some tinkering with a buff Paladin deck but the jury’s still out on how well it works. They sacrifice a bit of early game power for having stronger minions during the middle and late game by routinely buffing minions in their hand. Overwhelm them quickly, but don’t play into Consecration. 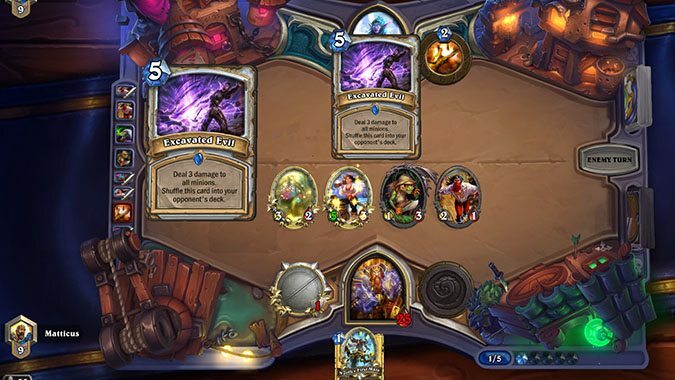 Priest: This is one of my toughest matchups. Dragon Priest is quite potent. Between Book Wyrm, Twilight Guardian, and Twilight Whelp, they have the minions to challenge you effectively for the board. A little luck is going to be needed here, and you have to hope they don’t draw into anything that can slow you down too much. Rogue: Ugh, Rogues continue to be the bane of my existence. You should probably trade against any early minions (preferably with a weapon). Try to keep as many early minions alive as you can before they eventually succumb to a Fan of Knives. Rogues don’t have much in the way of taunt minions or life gain. It’ll be a race between you drawing into your Arcanite Reapers and Leeroy, and them hitting a 9/9 Edwin Vancleef or something. Shaman: Jade Shaman appears to be the new flavor of the month, although you’ll still see some Aggro Shaman lists lying around. You should be able to race Jade Shaman decks before Jade Golems start becoming obnoxious with 5/5s or higher. 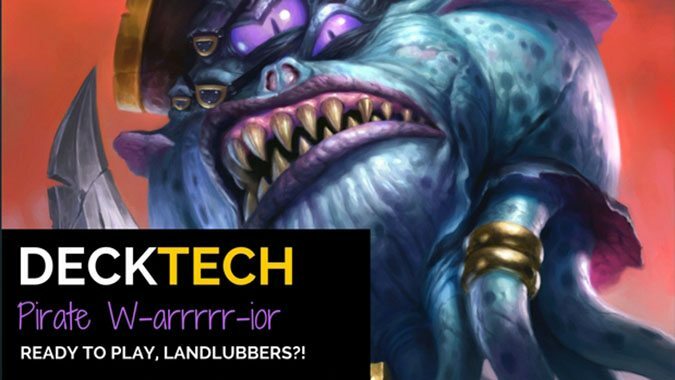 Protect your Berserkers and buffed Bloodsail Raiders. Thing from Below might slow you down, so you’ll have to trade something into it. Warlock: Zoo isn’t as popular these days. In fact, it seems to have fallen out of favor immensely. You’ll mostly be running into Reno Warlocks. Personally, I can’t wait until the next season of standard begins. Against Reno, you need to have some insane early game speed — and it’s possible, as I’ve managed to knock them out prior to turn 6, before Reno Jackson is a problem. Warrior: Welcome to the mirror match! You can expect your opponent to try to put the same moves on you as you would to them. If you happen to swap in an Acidic Swamp Ooze, that might be enough. Just time it for their Fiery War Axe or their Arcanite Reaper — even better if you can catch it when it’s been upgraded. This match will come down to who draws better. Enjoy the deck, and let me know how it works out for you on the ladder! Games should be quick no matter what. Either you’ll win early, or lose early.